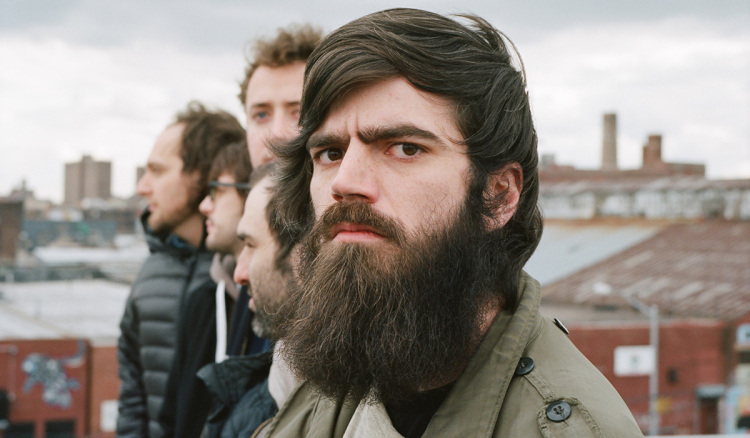 Like any show I’m excited about, I was really scared of disappointment while driving to this Boston Titus Andronicus (hereafter +@) concert. Since The Monitor, +@ has been one of my favorite bands. They combine dynamic, epic rock songs with to-the-point chord progressions embedded in punk rock history; and Patrick Stickles delivers growly, Joyceanly specific lyrics that are nonetheless deeply relatable. I fell in love with their latest album, The Most Lamentable Tragedy (a punk rock opera about manic depression, in classic +@ style), and there haven't been many weeks since 2010 when I don’t listen to them at least once. On top of all this, my girlfriend - who has a tendency to shout +@ songs in their entirety whenever she hears a single word of a lyric - was going to the show, too. There was a lot of hype, and we weren’t the only ones - the show sold out months before. The comfy Brighton Music Hall was packed, and nearly everyone jumped, yelled, and danced in unison as +@ delivered a fantastic 90-minute set. There was loud, pit-inducing punk rock. There were quiet, somber moments. There were everyone-come-together anthems. It was one of the best concerts I’ve been to. Eventually Stickles started playing his guitar, but with only DeLuca on stage. It was quickly apparent that Stickles was playing a solo version of “Upon Viewing Oregon’s Landscape With the Flood of Detritus,” a usually bolting, foot-stomping song about driving around the country and seeing people die on the highways while traffickers “sit and grit their teeth, hating that which comes between them and their coffee.” The room sounded like half the audience was sitting and gritting their teeth, hating that which comes between them and +@’s MAD RIFFS, while the other half sounded silently affected by Stickles whiningly crying out, “There are a thousand dreams never to come to pass, because dreams can’t be, nor people, indeed, built to last.” Regardless of which half of the audience you were, everyone chanted that last line, “Built to last,” over and over with Stickles. After the odd-but-moving solo, the whole band came out - including Adam Reich, who I recognized as playing guitar for the So So Glos show I saw at Paradise a while back. The lights turned green and purple, and the band played the first three songs of The Most Lamentable Tragedy straight through, and then immediately jumped into “Still Life With Hot Deuce And Silver Platter.” At this point, the room was going nuts, and you could already hear people’s dry throats trying to keep up with Stickles you-gotta-sing-along growls. The only reason Stickles wasn’t totally dead after “Hot Deuce” was probably because he was chugging a water bottle after each song. The band jumped into the one-two punch combo “Food Fight!” and “My Eating Disorder,” which is one of my favorite +@ songs. It really was something else to have a dreadfully skinny bearded Patrick Stickles shout with hair covering his eyes, “I know the world’s a scary place, that’s why I hide behind a hairy face” and then constantly croon “My eating disorder, my eating disorder, my eating disorder it’s inside me! !” Already it's a rare treasure to have a songwriter pour out his emotional struggles in front of you - but to see hairy, skinny reflection of struggle staring and shouting at you is moves you to the point of terrified paralysis. If everyone wrote down all the songs they hoped +@ played that night, I doubt many would leave without a checked-off list. There was the trio "Fired Up," "Dimed Out," and "More Perfect Union" that finishes off the first half of The Most Lamentable Tragedy; that eponymous song from their debut; "No Future" Part III" from The Monitor; "In A Big City" from Local Business. And looking back at that checked-off list: If +@ ever put out a Greatest Hits, a suitable title might be Anthems for Losers: Many +@ hits involve repeatedly shouting lines like “YOUR LIFE IS OVER,” “YOU’LL ALWAYS BE A LOSER,” and “I HATE TO BE AWAKE,” which have a self-deprecating euphoria that made the show feel like a Shaker worship service for unfulfilled twenty-somethings. One of the best moments was “A More Perfect Union” (not to be confused with the aforementioned "More Perfect Union"). “Now let’s travel back in time, back to 2008!” Stickles shouted. “I was 23 years old, and - true story - I lived here in Somerville, MA for a brief but formative period of my life. I was living with this girl and commuting to New Jersey every day, which was plenty of thoughtful time to write lyrics. Then one day the girl broke up with me, and I fled Somerville, never to return again, except to rock you guys. Yeah...There isn’t really a convenient punchline to this story, but it’s true, all true.” Then the band started that perfect opener to The Monitor, and Stickles’ lyrics resonated with me more than they ever did playing through my headphones, as he yelled about “waiting for the Fung Wah bus” and standing “beneath the lights of the Fenway.” The whole place went crazy as people screamed “Give me a brutal Somerville summer, give me a cruel New England winter!” For a place to be stamped into the opener of an album that so many people love, and then to be in that place...I’ll never forget that moment. Before their last song, Stickles idly said, “Yeah, rock is cool...Baseball is pretty cool, too. Let’s go Mets!” He pointed to the back of the venue, through the window, to the bar across the street, where you could see the Mets vs Dodgers game on a big TV. You could also see a few people trying to watch +@ in the Somerville cold. “And look at those sad faces in the window. We’re just going to play one more song. Can we let those people in? Just for one song? ?” Sure enough, they let those ten people in for “To Old Friends and New,” one of the softer songs on The Monitor with that final, Velvet-Underground-influenced chant “Well it’s alright, the way that you live - it’s alright, the way that you live” that’s perfect for a final +@ moment. The band left the stage, and I really wasn’t expecting an encore. The band already played a fantastic 90-minute set, and I figured +@ was above cramming in a bunch of hits into another 20-minute encore. The audience kept shouting, though, and +@ came back. “Alright,” Stickles said, “One more, but that’s all you get! It’s the bottom of the eighth inning - we gotta get outta here. Here’s one more song for you, Boston!” Stickles yanked off his shirt, revealing his incredibly pale, nearly emaciated body, and danced as the band burst into a cover of The Modern Lovers’ “Roadrunner,” by far the most fitting song for the end of a Boston punk show (and, fun fact, the song I got my first speeding ticket to). And they kept their word, walking off stage after that - and Stickles got to see the Mets beat the Dodgers a minute or two later, who went on to win the NCLS and play the Royals in the World Series. +@ is one of the fun bands keeping rockin’, fervent punk alive, along with their buds The So So Glos and Diarrhea Planet. Please keep coming to Boston, +@ - I’ll always see you.